The Pittsburgh Steelers hopes for another AFC North title were dimmed Monday night in San Francisco. 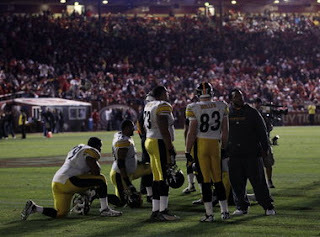 Even before the San Francisco 49ers stadium went dark, Steelers fans were concerned about their chances to win. Quarterback Ben Roethlisberger was already nursing a broken thumb and a high ankle sprain that would have kept most players out of the game. As tough as Ben is there was a lot of speculation he might not start. He hadn't practiced since the ankle injury, but there he was hobbling unto the field anyway. 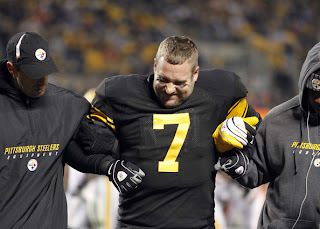 Ben received a shot for pain in the locker room that the Steelers hoped would last the whole game. When the lights went out before the opening kickoff, the 20 minute delay made that doubtful. Ben was off on his passes early in the game and he threw 2 interceptions. The Steelers defense was able to stop the 49ers from scoring touchdowns both times resulting in just two field goals. The the lights went out again. This time the game was delayed 15 minutes. Steelers fans could sense the game was turning in favor of the forty niners. It looked like the offense would be unable to score and the 49ers seemed to be always working with a short field. You just can't give a good team those kinds of chances. The 49ers’first touchdown came after Roethlisberger’s fumble was aided by a highly questionable Steelers penalty. Pittsburgh’s defense initially held the 49ers to a field goal on the drive, but the Steelers were called for unsportsmanlike conduct for leaping in an attempt to block the kick. Replays didn’t appear to support that call, and the 49ers took advantage by scoring a touchdown following the penalty. Just as it wasn’t a good night for Roethlisberger, it wasn’t a good night for the officials. This loss represents a huge missed opportunity for the Steelers. When the Baltimore Ravens and Houston Texans both lost on Sunday, it thrust the Steelers into a position where all they had to do was win their remaining three games to clinch home-field advantage throughout the AFC playoffs. But tonight’s 20-3 loss to the 49ers drops the Steelers back behind the Ravens in the AFC North, and now the Steelers appear to be a wild card team, likely headed for Denver and a date with the Denver Broncos in the first round of the playoffs. Injured Ben Roethlisberger Inspires Steelers To 14-3 Win! Already smarting from a broken thumb and wearing a splint on his throwing hand, might be enough to inspire any team to victory. But the Pittsburgh Steelers quarterback showed how tough he really is when he experienced an unexpected injury that would have sidelined most players. Ben Roethlisberger was not going to let his team down in a game the Steelers needed to stay ahead of the Baltimore Ravens for the lead in the AFC north division. The 9-3 Steelers were favorite to beat the 4-8 Cleveland Browns on Sunday and resume their march toward another playoff appearance . The crowd at Heinz field was glad to see Big Ben put together a masterful drive to give the Steelers a 7-3 lead before half-time. But, with less than 3 minutes left in the 2nd quarter, Ben was sacked and was unable to get up. After being looked at on the field, he was helped to the locker room for x-rays. It seemed like all the air was sucked out of the stadium. No one knew if he could even return to the sidelines, let alone play the second half. Back up Charlie Batch filled in, but was ineffective. Roethlisberger wasn't the only Steeler injured in the first half. All-pro center, Maurkice Pouncey also left the game with a leg injury and didn't return. To everyone's surprise Big Ben limped unto the field to start the 2nd half. Apparently he had a high ankle sprain but wanted to play anyway. With his ankle, shoe and lower leg heavily taped, he inspired his offensive linemen to give him the protection he needed to finish the game. After throwing an interception that almost cost them the lead, he found Antonio Brown down the sidelines for a touchdown that sealed the win. It should be noted that Pouncey also had a high ankle sprain and Troy Polamalu had a slight hamstring injury. At one point in the game it looked like Polamalu was having safety Ryan Clark pull on his arm as if he had a dislocation. At least the Steelers will have 10 days to heal before they have to play the 10-2 San Francisco 49ers on NFL Monday Night Football.